Meridian talks MQA: "Nobody asks for low quality audio" | What Hi-Fi? 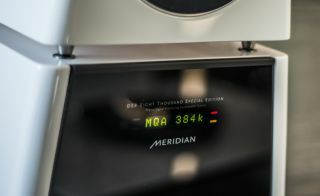 Meridian talks MQA: "Nobody asks for low quality audio"
We spoke to Bob Stuart, the founder of Meridian Audio, and Craig Kallman, CEO Atlantic Records, about high-resolution audio, Meridian's new MQA format - and selling high quality audio to the masses. The new Master Quality Authenticated format from Meridian aims to deliver studio quality sound in smaller packages, ideal for downloading and streaming. Tidal has already told us it is planning a high-res streaming service using MQA. But what is MQA? Bob Stuart explains: "MQA is a revolutionary new British technology that aims to bring us right back to the sound of the studio. The idea behind MQA is to get that sound in to a format that's easy to deliver so we can turn it in to a stream that's small enough to stream today or download today. So the opportunity exists to have the real sound of the studio delivered to the customer for the first time in the history of recorded music. "Nobody asks for low quality. MP3 was because the Internet had low bandwidth at the time. There was no such thing as a low-res and high-res vinyl record. Over 50 years, for the average consumer, the quality of the sound has gone down and down. That's important, not because they're all audiophiles but because the more you hear, the more you feel, the more the music communicates to you. What we find when customers hear this high-quality sound is that they don't skip to the end, they hear the whole song." Craig Kannel, CEO Atlanic Records, said: "We have a fundamental obligation to serve our artists... to deliver best in class sound. The opportunity presented itself when we got to hear MQA. It's a real opportunity to [deliver] all the hard work oft the artists, producers, engineers, that are working in the studio. The platform needs the labels behind it." And how will they in turn convince customers? "The artists are the most powerful voice... They're the mouthpiece." We shall see. Neil Young is certainly doing his bit to spread the word about high-res audio. You can watch the full 10-minute interview above. See all our CES 2015 videos, plus plenty more besides, on the What Hi-Fi? YouTube channel. We awarded Meridian MQA a Stars of CES 2015 award in recognition of the impact we believe it will have on helping bring high-res streaming to market.